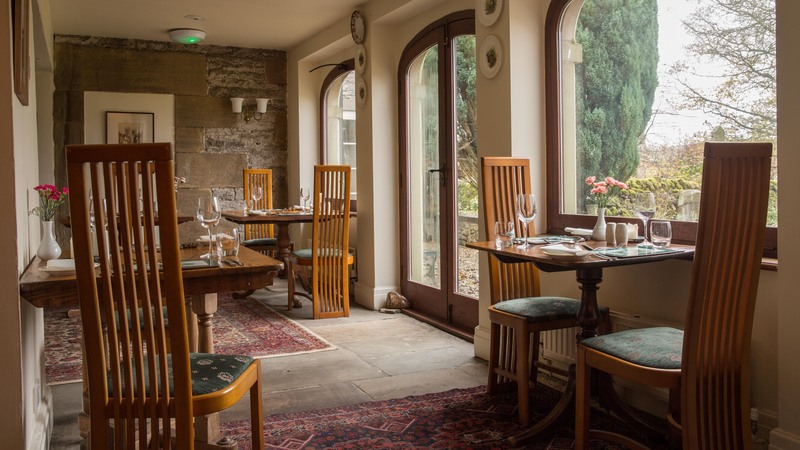 If you are looking for somewhere special in the Peak District to eat out, Biggin Hall offers a stunning menu in the restaurant which is open to non-residents, serving lunch, dinner and afternoon tea. Please see our opening times below. Biggin Hall’s oak-beamed restaurant possesses an abundance of character and is as cosy by candlelight in the evening as it is beautiful during the day with stunning views. Championing a whole host of local produce and seasonal ingredients, embracing a passion for tradition and excellence Head Chef Mark Wilton makes full use of the Peak District's natural larder when selecting produce for the regularly changing menu. Many of the ingredients are of local origin, with the accent on free-range, wholefoods and natural flavours, together with a seasonal selection of vegetables. The emphasis of the menu is on simplicity and taste. Meals are imaginatively planned and freshly cooked with daily changing menus featuring a set course with vegetarian option. It is this straight forward approach to cooking that allows the quality of the ingredients to shine through. In the bar, there is a choice of real ales, guest beers, superb house wines and a highly commended wine list to complement your meal. For residents, a full English and Continental Breakfast is served in the dining room between 8 am and 9.30 am. Relax by the open fire, enjoy excellent food and a good selection of wines whilst soaking up the convivial atmosphere. Many guests return year after year to sample the delights of our modern British cuisine. We are happy to assist with any special dietary requests, given prior notice. So join us for lunch with views over the lawns and the Peak District hills or for a special evening meal and choose from our hearty and modern English menu. Booking is essential.